President Donald Ramotar has said that after lengthy and fruitful discussions with mutual understanding between government and the Leaders of the Opposition Parties, they [the opposition] returned the next day and [suddenly] changed their minds, a move that was unexpected by his government. He was addressing members of the Berbice business community at the Albion Estate Senior Staff Club where he met, discussed issues, and listened to the concerns of the three Chambers of Commerce in Region Six. The President was accompanied by several of his ministers including Minister of Agriculture, Leslie Ramsammy; Minister of Public Works and Transport, Robeson Benn; Minister of Housing and Water, Irfaan Ally and Minister of Finance, Dr. Ashni Singh. Also present was Chairman of the Private Sector Commission, Ramesh Dookhie and Region Six Chairman, David Armogan. President Ramotar used the occasion to lambaste the opposition parties, Alliance for Change (AFC) and A Partnership for National Unity (APNU) for the budget cuts. He urged the businessmen and three Chambers of Commerce to issue a joint condemnation of the cuts since they would directly impact their businesses and that of their members. President Donald Ramotar (with dark shades) and his delegation during their interaction with members of the Berbice business community. According to the President, he recommended an increase of zero-rated items while the study of the impact of the VAT cut was proceeding. The opposition, he said, was reluctant and lukewarm to these suggestions. Ramotar said that he urged the opposition to let the bargaining process “take its course and let the unions negotiate with the Public Service Ministry. He noted that his colleagues in Parliament “answered every single one of their [the opposition’s] questions…we did not shirk from any of the questions. they can’t say they did not know what they did because we gave them the list of every single contract worker and they even knew before….and so they made these cuts that are possibilities of closing us down”. Earlier in the day, during a TV Interview, when asked whether snap elections could be called for, the President, said that if the opposition continues to deliberately block development in the country, he will have no other choice but to call for snap elections but hopes it would be a last resort. The various Chamber Presidents raised several concerns which they urged the President to look at. 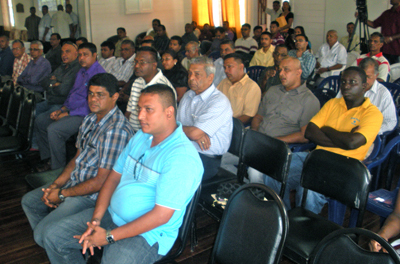 These include difficulties that businessmen face such as the risky trip with their firearms to Police Headquarters, Eve Leary to have their guns stamped; the Guyana- Suriname Backtrack service; sawmilling on the Upper Corentyne; the hassle businessmen have to face to get their imports certified and dealt with by the relevant authorities; the poor state of the Number Sixty- Three beach; poor state of fire hydrants in the Berbice area; poor lighting on some of the roads in the region, among many other issues. The President of the Upper Corentyne Chambers of Commerce recommended that the old Skeldon Sugar Factory be put into operation once more so that the industry can still process canes and make sugar even though the new factory is experiencing numerous problems right now.